Successfully Added 5 Inch Touchscreen GPS Navigator with Wireless Nightvison Rearview Camera (4GB) to your Shopping Cart. 5 Inch Touchscreen GPS Navigator with Wireless Navigator Rear View Camera: A top notch touchscreen GPS navigator that comes with a colorful menu display, multimedia functions, and a wireless navigator rear view camera. 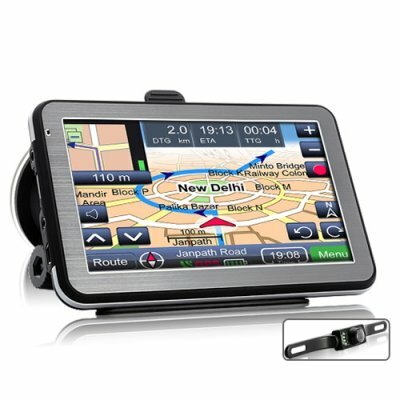 Enjoy the crisp 5 Inch touchscreen with high resolution (800x480) as you navigate effortlessly with this high quality GPS Navigator. The menu icons on this GPS hand held navigator come with a graphical refresh unlike tradition mainstream models, and it presents a more colorful interface with finer gradients. If you want a high quality GPS solution for your travel management, this is the product to look at getting. With this device you do not have to dismantle your vehicle’s dashboard and install a car DVD player if you don’t want to. You can play multimedia files like WMV, WAV, AVI, MP3 and MP4 saved in the external 4GB micro SD cards(included). This handheld GPS navigator with built in multimedia applications offers you a variety of entertainment options for using it in your car, including music, video, games and e-book. Additionally, this 5 inch touch screen GPS navigator's FM transmitter along with the Bluetooth feature allows drivers to pair their cell phones with the GPS navigator and enjoy hands free calling and listening to your favorite music through you cars stereo speakers. Your media interests are well looked after with this great gadget and you can enjoy driving to its fullest. This 5 inch GPS navigator comes with a wireless rear view camera that helps you reverse and parallel park with comfort and ease. The wireless rear view camera gives drivers the confidence in reverse and parallel parking. The camera also includes automatic nightvision, so you can use it night or day! This is a product that is proven to last and will also prove to provide you with the functionality you require. This 5 inch touchscreen GPS navigator and wireless navigator rear view camera makes a great electronic car gadget for drop shipper’s and eBay resellers. It’s in stock for single or bulk order at a factory direct wholesale price directly from Chinavasion.